When I was a young reader, I loved Robert McClosky’s books about Homer Price, a boy who grew up in a tourist camp outside the fictional town of Centerburg, “where 56 meets 56A.” Homer had many admirable qualities, particularly an abundance of common sense, but my favorite thing about him was that he had a pet skunk named Aroma. The skunk wandered into the family kitchen one evening when Homer was enjoying his nightly snack of milk and cookies. (Homer’s mom was not around — in fact, Homer’s parents were notable because they didn’t interfere much in his everyday activities.) Homer tamed her with saucers of milk and got her to come to his whistle. He trained Aroma to climb into a basket tied to a rope so that she could visit in his room while Homer worked on his hobby, building radios. Aroma slept in an open suitcase until it was time for her to travel by basket back to the ground and her den under the house. Aroma starred in a story called “The Case of the Sensational Scent,” where her proclivity for sleeping in suitcases, and her willingness to spray when annoyed, helped to catch a group of robbers. I wanted a skunk, of course, but my otherwise pet-tolerant parents nixed the idea. I looked into it, though, and I found out somehow that it was possible to purchase a skunk that had been “de-scented” by a surgery that removed the offending glands, located on either side of the tail. The answer was still NO. I moved on to hectoring my parents for a pony. 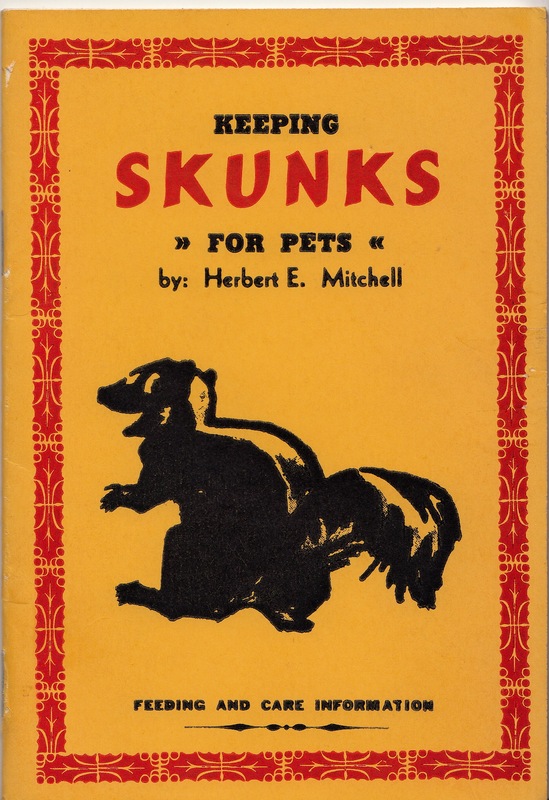 Herbert E. Mitchell, Keeping Skunks for Pets: Feeding and Care Information, 1964. 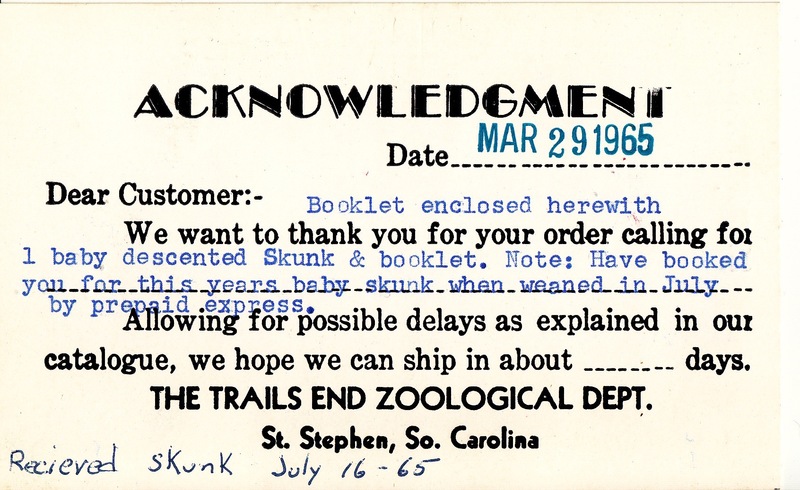 Better yet, the booklet contained this postcard acknowledging an order for a baby skunk, with this note at the bottom: “Recieved Skunk July 16-65.” I haven’t yet been able to find out anything more about the “Trails End Zoological Dept” in St. Stephen, South Carolina, but I presume that Herbert E. Mitchell was the proprietor. Keeping skunks as pets is illegal in most states. But where it is allowed, domesticated skunks come from breeders who have the scent glands removed before the kits are five weeks old. There is actually an American Domestic Skunk Association,” a non-profit group “founded and run on love of the domestic skunk,” meaning skunks that have been bred and born in captivity by licensed breeders. Homer Price’s pet Aroma was what I call a “casual pet.” Casual pets were usually semi-tame wild animals that had ongoing relationships with humans they seemed to recognize and trust. My great grandfather had one, a groundhog that lived under the woodshed and would come when he called it. (I tell this story in Pets in America and include the only snapshot of the critter.) So did my great-uncle, who tamed a young squirrel that would ride on his shoulder but lived outdoors in a tree near his house. My research has uncovered many examples of these, so Aroma was a kind of pet that would have been recognized by Robert McClosky’s young readers when the book Homer Price was first published in 1943. .
On the other hand, the “domestic skunk” of the booklet and the American Domestic Skunk Association represents humans’ efforts to add more species to the practice of intensive pet-keeping, where animals’ lives — mating, breeding, birth, medical intervention, feeding training, and ultimately the time and manner of death — are subject to ongoing intervention. Hi! I was recently online looking for anything I could find on my great-grandfather…Herbert Ellison Mitchell and while doing so I came across your page!!! I would love to speak with you or you may email me in return so that we can speak about his book!! My grandfather, Danny Mitchell, would be thrilled!! As well my grand uncles and aunt. Half of his 8 kids are still alive and I would love to suprise them with this whole thing. Thanks for getting in touch! When I was doing research for the post, I could not find anything on your great-grandfather, although I did find a citation for a memoir that I have not been able to locate anywhere. I’ll keep looking. If anyone in your family has a copy that they are willing to share, let me know. I think there is a very interesting story here!